The Mercedes-Benz CLA was introduced in 2014 as a spin-off from the A-Class hatchback range. The Mercedes-Benz CLA was introduced in 2014 as a spin-off from the A-Class hatchback range and uses the same engines and chassis as the A-Class. It’s essentially a compact four-door saloon version of the A-Class, but Mercedes decided to give it some swoopy styling and sell it as a coupe (as well as a compact five-door estate called the Shooting Brake). Think of it as a fun-sized version of the larger Mercedes CLS and you won’t be far wrong. 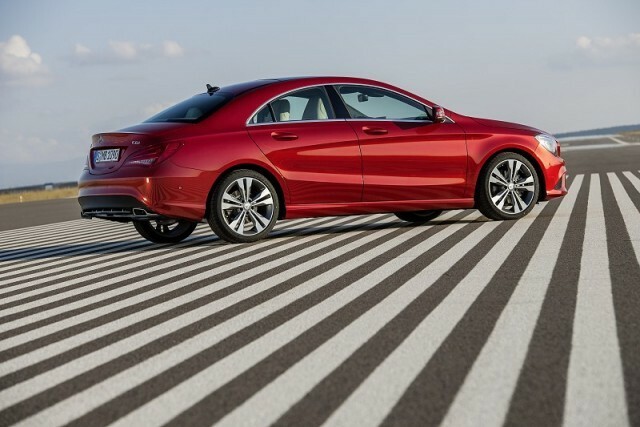 For a compact model, the CLA’s range is pretty broad. There is a choice of two petrol engines (a 1.6- and a 2.0-litre, both turbocharged) in four different power outputs, and two diesel engines (1.5- and 2.1-litre) in three different power outputs. You also have a choice of front- or four-wheel drive, manual or automatic transmissions and the two separate body styles. There’s a base trim, which is just called CLA, and then Urban and AMG Sport versions, plus the hugely powerful CLA 45 AMG sitting on top as a separate model by itself. Standard equipment on all models includes air conditioning, Bluetooth phone connection, 17-inch alloy wheels, fabric/leather seats and active brake assist. The smaller diesel is the smoother and quieter of the two. It’s actually a 1.5-litre Renault unit, shared with Mercedes as part of a broad technology partnering agreement between the two companies, and while 109hp isn’t much, perhaps, it’s sufficiently brisk and very economical. The larger 2.1-litre engine is Merc’s own, but it’s rather noisier, even if it does hit a lot harder in performance terms. Those covering small mileages should definitely go for a petrol CLA — a CLA 180 with the 122hp 1.6-litre engine is pokey enough, economical and very refined. Only those with the deepest of pockets should go for the 381hp CLA 45 AMG, and while the Shooting Brake is a touch more versatile than the saloon, it’s not actually that much more spacious in real terms. The AMG Sport trim is a good pick, as it comes with leather seats, a chunky body kit that really suits the CLA’s lines, 18-inch wheels and sports suspension. The CLA isn’t for those seeking a practical family car, even with the optional Shooting Brake bodywork. It’s a car that’s all about style, with just enough interior space to make it a viable day-to-day proposition. Agile and good to drive, it’s a great starter car for those looking for an affordable entry to Mercedes coupe ownership.